Marbella is most commonly known for being a glamorous resort town and a playground for the rich and famous. However, aside from the glitz and glamour is a city rich with archaeological heritage and a breath-taking natural landscape; from its encompassing ´La Concha Mountain´ to its charming Old Town. Needless to say, there will never be a shortage of things to see in Southern Spain’s answer to St. Tropez. Marbella is a city and municipality in the South of Spain, situated in the province of Málaga in the autonomous community of Andalusia. Located on the Costa del Sol, it is the headquarters of the Association of Municipalities of the Andalusian region. Geographically, Marbella rests on the Mediterranean Sea, between Málaga and the Strait of Gibraltar, in the foothills of the Sierra Blanca. It covers an area of 117 square kilometres crossed by highways on the coast, which are the main entrances into the the city. The population in 2012 was just over 140,000, subsequently making it the second most populous municipality in the province of Málaga and the eighth in Andalusia. 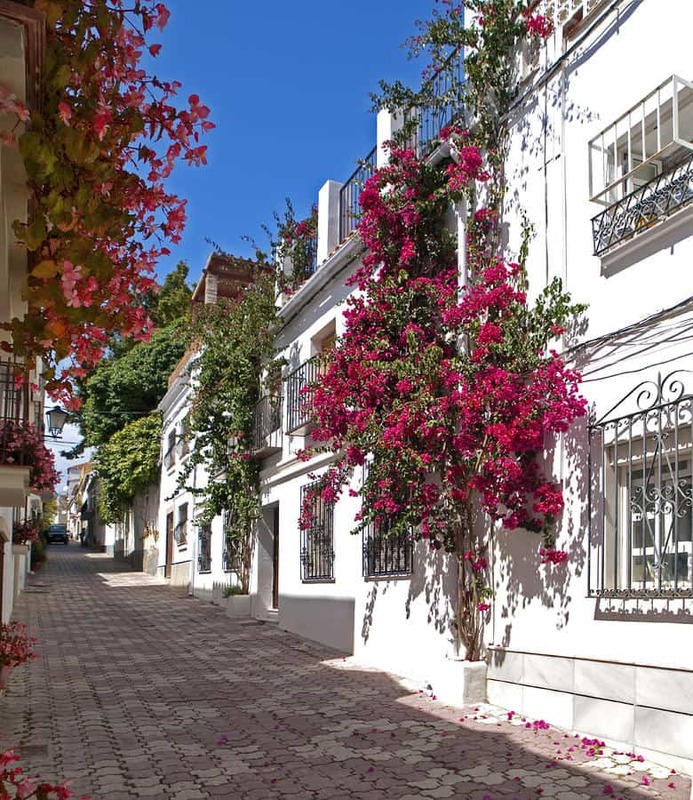 Marbella is famous for being one of the most important tourist cities in the Costa del Sol, its high climate and tourist infrastructure brings in many international tourists. It enjoys an average annual temperature of 18 °C (64°F) and 320 days of sunshine with less than 50 days of rain. It is also the greenest city in Spain and Europe’s second greenest city. Marbella is also home to many Michelin star restaurants, the most famous being Dani Garcia’s ´Calima´. Archaeological excavation has led to the belief that human habitation in Paleolithic and Neolithic times existed in Marbella. Some historians believe that the first settlement on the present site of Marbella was founded by the Phoenicians in the 7th century BC. However, no physical proof has been found on any significant settlement, although some artifacts of both Phoenician and Carthaginian settlements have been excavated. The Roman population left their stamp on many buildings in what is now the El Casco Antiguo (Old Town). Embedded in the Moorish castle walls are three ionic capitals, and recent discoveries in La Calle Escuelas (school street) and other various parts of the town show scattered remains which also corroborate to Roman occupation. Most famously, West of the city on the grounds of the Hotel Puente Romano is a small 1st century Roman Bridge situated over a stream. The bridge was linked to the ancient Via Augusta, which once linked Rome to Cadiz. In addition to this, there are remains of other Roman settlements e.g. Villa Romana on the Rio Verde (Green River), the Roman baths at Guadalmina and also the ruins of a Roman villa and early Byzantine basilica at Vega del Mar. All of which indicate human lifeform in the area. Later, in circa 10th Century, during the Islamic rule when the Caliphate of Cordoba was in power, he protected the coastline and built a number of lighthouse towers along it. During the Moorish rule, the Alcazaba, which was an arabic citadel was constructed as a wall to protect the town, the most revered building was the mosque. Orchards surrounded the village, and gardens filled with crops such as figs and mulberry trees were spread out. Silkworm cultivation was a popular practice at this time. Many years later in 1485, the town came to the end of its Moorish rule and eventually it was passed into the hands of the Crown of Castile. During this time, The Plaza de los Naranjos (Orange Square) was created. It was built with Castilian design, and some of the buildings that surround it were also built around this particular time. Initially, moving into the 20th century was not a very popular time for Marbella. At the start of the Spanish Civil War, Marbella suffered its fair share of anticlerical violence and some buildings were set alight after the failed uprising which consequently led to the start of the civil war. After the devastation of World War ll, the town was reduced to a small village with only 900 inhabitants. However, it was with great thanks to Ricardo Soriano, the Marquis of Ivanrey that the town eventually began to prosper. Upon his emigration to Marbella, he acquired a country estate and built a resort on it. He popularised the town among his rich and famous friends and ultimately started the development of tourism in Marbella. In 1954, Prince Alfonso of Hohenlohe-Langenburg, the Nephew of Ricardo Soriano established his own business venture in Marbella. He transformed his own residence, Finca Santa Margarita into the renowned Marbella Club Hotel, which is an internationally acclaimed resort popular with movie stars, business executives and aristocrats. As Prince Alfonso had good relations with European nobility, the hotel quickly became a popular vacation destination among the social elite. Designated as the first luxury hotel in the Costa del Sol, it soon welcomed many esteemed guests such as Ava Gardner, Audrey Hepburn, Cary Grant and Laurence Olivier. In 1974 King Fahd of Saudi Arabia arrived in Marbella from Monte Carlo. In the 1980s he built a monumental compound, the `Mar Mar Palace’ which was modelled on The White House. His house was fully staffed with its own private clinic and mosque. Before his death in 2005, King Fahd spent many summers in his Marbella palace. He would bring with him an entourage of 3000 people, rent 300 hotel rooms, 500 cars and his one month stays would usually invest a whopping 40-80 million euros into the economy. He even left a tip of 235,000 euros at one point. Which is comprised of the the ruins of an old Arab wall, narrow streets, churches, and quaint shops and boutiques. The town also includes the two historical suburbs of the city, The Barrio Alto to the North and The Barrio Nuevo to the East. At the heart of the Old Town sits Orange Square (Plaza de los Naranjos) , dating back to 1485 it is an exquisite example of Castilian Renaissance design. The square is surrounded by white-washed houses and several significant historic buildings. Some of which include: The Town Hall, The Mayor’s House, The Chapel of Santiago, The Santo Cristo de la Vera Cruz Square, the remains of the Arab Castle and The Church of Saint Mary (Iglesia Mayor de la Encarnación) which is the dominating presence of the square. • The Town Hall – built in 1568 by the Catholic Monarchs in Renaissance style houses the original council chambers which are now divided into two floors. An artistic mudejar style carved ceiling covers the upper floor and its walls are painted with murals that date back to the early 16th century. The exterior displays a sundial, coat of arms and headstones bearing inscriptions in Old Spanish commemorating the taking of the city by the Catholic Monarchs. • The Mayor’s House – combines a mixture of Gothic and Renaissance elements in its façade, it features a Mudejar style roof and stained murals on the walls. • The Chapel of Santiago – The oldest building in the city dating back to the 15th century, contains a wooden effigy of Christ in Neo Baroque style. • Ermita del Santo Cristo de la Vera Cruz (Hermitage of the Holy Christ of the True Cross) – Located in the Barrio Alto, the 15th century square tower is one of the highlights of The Old Town. • The Church of Saint Mary – Construction for the Church started in 1618 and the interior underwent restorations in 1936 after the Spanish Civil War. The main facade of the building is decorated with a grand red stone entrance in Baroque style. The church organ is the focal point comprising of 5000 pewter, copper and wooden pipes; four keyboards with a combined 56 notes; a 36 note pedal and various other characteristics. Between the old town and the sea in the area known as the “historic extension” (ensanche histórico), there is a small botanical garden on Paseo de la Alameda, and a garden with fountains and a collection of ten sculptures by Salvador Dalí on the Avenida del Mar, which connects the old town with the beach. To the west of this road, passing the Faro de Marbella, is Constitution Park (Parque de la Constitución), which houses the auditorium of the same name and the Skol Apartments, designed in the Modernist style by the Spanish architect Manuel Jaén Albaitero. In an area which connects the old town with the sea front is the ensanche historico. Inside this area is the Paseo de la Alameda which is home to a small botanical garden, fountains and a collection of sculptures by the famous Salvador Dali on the Avenida del Mar. Passing the Faro de Marbella on the west of this road is the Constitution Park (Parque de la Constitución), one of the most visited parks in Marbella. It houses the auditorium and the Skol Apartments, designed in the Modernist style by the Spanish architect Manuel Jaén Albaitero. The park also has an amphitheatre which is used occasionally in the summer season for outdoor concerts and plays. The amphitheatre with its decadent arches and tiling is a beautiful example of traditional Andalucian architecture. Although it is named ´the Golden Mile`, this famous stretch of road actually spans across 4 miles. It stretches from the Western edge of Marbella through to Puerto Banus. It is an exclusive area which is home to some of Marbella’s most luxurious villas, mountain view estates and landmark hotels. Some of which include the Melia Don Pepe, Marbella Club Hotel and the Puento Romano Hotel. The area was developed during the tourism boom of the 1960s. The Golden Mile is divided into two parts by a motorway that runs through it, and along the motorway are several business centres, hotels, golf courses and other luxury services. Whilst the beachside of the motorway is fully developed, the mountain side is still undergoing development. It is not to be confused with the New Golden Mile which is a name given to the area between San Pedro and Estepona. Marbella’s coastline, comprised of 27 kilometres (17 miles) is divided into 24 beaches. They all have different features however, due to expansion of the municipality they are all now semi-urban. The beaches are highly popular in the summer months and they all offer beach bars (chiringuitos), restaurants, water sports, sun loungers etc. The most popular beach is La Fontanilla which is 800m long and next to the port. Other notable beaches include Artola beach, Cabopino (one of the few nudist beaches in Marbella), Venus and Playa Faro. There are also those of Puerto Banus and San Pedro Alcantara which have been awarded the blue flag of the Foundation for Environmental Education for compliance with its standards of water quality, safety, general services and environmental management. The best way to walk up from the promenade is through the Avenida del Mar, past the Alameda gardens. Puerto Banus is a marina located in the area of Nueva Andalucia. First built in 1970 as a luxury marina and shopping complex, it is now one of the largest entertainment centres in the Costa del Sol, with 5 million annual visitors and its popularity among international celebrities. The majority of the visitors tend to be Northern European (especially from the UK), Arabs (mainly from Saudi Arabia and Kuwait) and other Spanish tourists. Puerto Banus sees some of the most exotic cars and large yachts, owned by celebrities and the business elite. In the summer months it is not uncommon to see luxury cars such as Rolls Royces, Ferraris and Lamborghinis placed in and around the port. The focal point of Puerto Banus is the marina. It has berths for over 900 boats, which include those of the King of Saudi Arabia, along with several of the world’s wealthiest individuals. Behind the harbour, its streets are lined with bars, boutiques and nightclubs. Some of the luxury boutiques include; Dolce & Gabbana, Versace, Bvlgari, Gucci and Christian Dior. Puerto Banus is also home to one of the largest El Corte Ingles department stores in all of Spain. 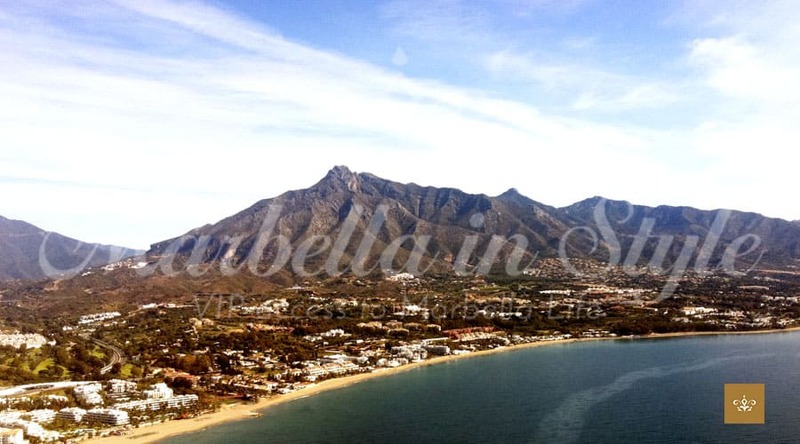 The La Concha mountain which stands at 1200m is the highest mountain in and around the area of Marbella. The literal translation of ‘La Concha’ means ‘Shell’, and its name is owed to the fact it is shaped distinctly like a shell. La Concha is situated in the southern part of the Sierra Blanca mountain range – which is an extension of the beautiful Sierra de las Nieves Natural Park. When planning a hike up La Concha, there are two main routes which can be taken. The first is from Istan and the second from the El Refugio de Juanar. The difference in routes is that the first is shorter in length however, it is steeper and more demanding than the second route.